Even more presenters will be posted here as their information becomes available. The Amphibians of Vernal Pools program is one of five presentations in the Vernal Pool Education Package This program describes what it means to be an amphibian. It details the special needs of amphibians and the unique conditions of vernal pools that support them. It provides and overview of all of the frogs and salamanders that use vernal pools. Kyle is the Director of Natural Resources for the Richland County Park District based out of Gorman Nature Center in Mansfield, Oh. He graduated from Kenyon College in 2013 with a B.A in Biology. Kyle is a lifelong resident of North Central Ohio and resides in Shelby, OH. He is a board member for the Ohio Odonata Society, Richland Soil & Water Conservation District, and a member of the Shelby Floodplain Management Commission. He is also the North Central Ohio State Coordinator for the Monarch Joint Venture's Integrated Monarch Monitoring Program. Lisa’s program begins with wood frogs and progresses seasonally. Songs are compared so that listeners gain practice in distinguishing between them. Habitat differences will also be noted. Not all frogs and toads sing at the same time, and they don't all sing in the same habitats. Identifying the songs of frogs and toads becomes easier when we consider time of the season, the specific habitats, and which species may be heard singing with whom. Frogs that sound similar, such as Leopard and Pickerel Frogs, will be compared and sonograms will help us see as well as hear the difference in their song. In addition to my own field recordings, I will use my own photos of these species and include my own experience in searching for them. Dr. Rainsong is a Music Theory faculty member, Cleveland Institute of Music with a Naturalist Certificate, Cleveland Museum of Natural History. Dennis represents the Ohio Environmental Education Fund. Do you need education funding to teach about Vernal Pools and Wetlands? Do you need equipment to help reinforce this education? This extended session will explain what to include in a grant application for education purposes. This session will provide details on past funded grants for vernal pool and wetland education and what to include in an education application. Dennis is presently employed with the Ohio EPA, Ohio Environmental Education (OEE) as an Environmental Public Information Officer 1. In January 2015, he was appointed Project WET State Coordinator for Ohio. In his spare time, he is a carded equine judge for the American Buckskin Registry Association, International Buckskin Horse Association and the Pinto Horse Association. He is also certified 4-H Equine Judge in Ohio and Michigan. MaLisa will cover the basics of Odonata in Ohio with an emphasis on dragonflies and damselflies found in or near vernal pools. She is currently State Coordinator of the Ohio Dragonfly Survey and has a Master’s of Science in Entomology from The Ohio State University and a Bachelor’s of Science from Marietta College in Biology. She has previously worked on research projects involving urban habitat management for beneficial insects, bee and ladybeetle species richness surveys, assessing mangrove restorations at abandoned shrimp farms, among many other projects. She currently lives in central Ohio with her partner, dog, and indoor cat. MaLisa will cover the basics for in aquatic samples and ending with an in-depth look at immature dragonfly and damselfly identification. Ever wondered how you can make a difference? Come to learn all about what a citizen scientist is and how you can become one to make a difference to amphibians here in Ohio. You will learn all about FrogWatch USA, a citizen science program that trains people to identify frogs and toads by their calls alone so they can monitor wetlands near them to report all the information into a national database. Carrie Bassett has a BA in Biology with an emphasis in Secondary Education. She has worked at the Akron Zoo since 2005 as an Education Specialist. She is a certified coordinator of FrogWatch USA through the Association of Zoos and Aquariums. This extended session offers complete training in FrogWatch USA field procedures that could result in your becoming certified as a credible data collector. Co-presented with Carrie Bassett (see above). Michael Phillips has a BA in Biology and a BA in Environmental Studies. He has worked at the Akron Zoo since 2007 and previously worked at the Cuyahoga Valley National Park for 2 years. He is a certified coordinator of FrogWatch USA through the Association of Zoos and Aquariums. Michael Phillips is currently a Zookeeper at the Akron Zoo and co-coordinator of the Akron Zoo Chapter of FrogWatch USA. The Amphibian Index of Biotic Integrity (AmphIBI) is an assessment tool that uses amphibians as indicators of the ecological conditions of the vernal pools they utilize. Measures of the sensitivity, tolerance, and abundances of amphibian species are used to score and accurately place vernal pools along the scale of ecological integrity. The field protocols and science behind the AmphIBI metrics and how they are used to assess vernal pools is revealed in this presentation. Mick has monitored over 200 vernal pools and more that 150 wetland restoration projects across the state of Ohio. He is a Professional Wetland Scientist who works in the Ohio Mitigation Program for The Nature Conservancy. He also instructs environmental training courses at the Midwest Biodiversity Institute (MBI), including Ohio Rapid Assessment Method for Wetlands (ORAM), Vegetation Index of Biotic Integrity (VIBI), ID of Common Wetland Plants, Ohio Amphibians/Amphibian IBI (AmphIBI), Intro to Wetlands, Wetland Delineation, Wetland Botany, and Primary Headwater Habitat. Prior to joining MBI and the TNC Mick worked as a Wetland Ecologist at the Ohio EPA where he was an instrumental contributor in developing Ohio's Wetland Program which has been used as a model for the entire country. Mick will provide species accounts including life histories, breeding behavior, specific habitat needs, calls and other interesting data. Ohio Vernal Pool Amphibians and their shared and individual habitat needs are discussed. Interesting characteristics of representative species are discussed. Keys to identification are presented and calls of frog species are played. A study of urban vernal pools in central Ohio selected 14 vernal pools from a population of 200 randomly selected urban wetlands. At the same time five “reference condition” vernal pools were monitored to ensure that vernal pools could score high on the assessments given the weather conditions that year. The assessments found that urban vernal pools cannot function at as high of levels as those in rural settings. A number of interesting facts about urban vernal wetlands were learned. The largest factor restricting higher quality amphibian communities from utilizing urban vernal pools is the high intensity of surrounding land uses. Brian will show how using Geographic Information System (GIS) technology can identify the best potential sites for vernal pool restoration projects likely to provide breeding habitat for sensitive amphibian species. 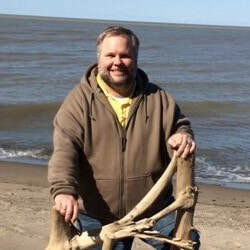 He will discuss a project conducted in 2009 while employed as a wetland ecologist at the Ohio EPA. Mick Micacchion (co-author) and Brian conducted a study to try and identify existing high quality vernal pools using GIS. The model was run and field tested using detailed wetland assessment procedures. A final map was then created to specify those locations having the highest potential for vernal pool restoration in Ohio. Brian is currently a Stream and Wetland Mitigation Coordinator with the Ohio Chapter of The Nature Conservancy. Previously, he worked as a Wetland Ecologist with the Ohio EPA, where he coordinated all wetland assessment research and provided technical assistance to a wide variety of public and private professionals regarding Ohio’s wetland resources. This is an introduction to the breeding biology of Ambystoma salamanders and in particular the evolution and ecology of unisexual (all-female) Ambystoma salamanders. Ever wonder what is kleptogenesis? She will provide an overview of her research projects with unisexual Ambystoma. Dr. Greenwald is an Associate Professor of Biology at Eastern Michigan University She received her B.S. (Biology) in 2002 from Brown University, and her Ph.D. in 2009 from the Department of Evolution, Ecology and Organismal Biology at Ohio State University. Current research in my lab falls under the categories of molecular ecology or conservation genetics. This means that we use molecular tools to answer ecological or conservation-related questions." Organizing a vernal pool field trip for your visitors can be easy and fun. This presentation will cover how to organize a safe and enjoyable vernal pool expedition. For discovering a pools hidden wonders David will share techniques that he has practiced for years including how to search for amphibians, night hikes, dip netting and the use of a portable display table. The Herps Alive Foundation is dedicated to saving, rehabilitating and caring for unwanted, neglected and abused reptiles and amphibians, and to finding new homes for them when possible, with an emphasis on educating the public, the Herps Alive Foundation has found homes for nearly 1,000 reptiles, amphibians and invertebrates in the past two years. This informal session will give attendees a chance to meet and greet some of our ambassador animals. This session will describe the nature of the Ohio Vernal Pool Network (OVPN), its history and expansion. The recent release of the vernal pool education package will described both in terms of the products it contains and the services that go along with it. This invitation to potential citizen-scientists is one of five presentations in the Vernal Pool Education Package. This program attempts to recruit volunteers to visit vernal pools and report data and observations using the smartphone app or iNaturalist website. The Ohio Vernal Pool Network iNaturalist Program is a repository for information and a community of people working together to document the diversity of life in Ohio’s vernal pools. Fairy Shrimp are the most charismatic vernal pool macroinvertebrates. Their dazzling, hypnotic motion and their unpredictable presence earns them the epithet "fairy" to emphasize their somewhat supernatural reputation. This presentation will describe Ohio's fairy shrimp and explain the survival skills of this vernal pool obligate. North American vernal pools are distinctive because of their burrowing crayfish fauna. Not all areas of North America harbor burrowing crayfish and the species of crayfish present can vary considerably by species and number of species. To make matters worse, little is known about how they interact with the ecosystem and what their influences are. Some papers have reported the presence of other Classes and Orders of organism co-inhabiting their burrows. A statewide survey of Indiana's burrowing crayfish burrows by the author illustrates the variety of fauna present but only delved into the most cursory levels. Mr. Thoma began his study of crayfish in 1971 as a volunteer assistant to Prof. Ray Jezerinac (OSU). For thirty years he either assisted Ray sampling crayfish in the Appalachian Mountains or conducted his own research in the area. In 2004 he resigned from the Ohio EPA (where he conducted field surveys of fishes) and embarked on the full-time study of crayfish. He has conducted statewide surveys of Ohio, Indiana, and Virginia. He has authored or coauthored over 15 new species of crayfish over his career and holds a BS from Ohio State University. Bob Bartolotta will explain the species of mosses, liverworts, algae and fungi that are often overlooked in wetlands. They are immensely important as food for animals, they are important photosynthesizers (except fungi). Fungi are important decomposers in wetlands. Participants will learn what species occur and how to look for them in wetlands. Bob is currently retired after working at The Cleveland Museum of Natural History for thirty-four years where he has led over 1500 field trips and has taught in excess of 35,000 people. He has a degree from Case Western Reserve University with a biology and in Plant Taxonomy from The Ohio State University. John provides a unique presentation detailing many of the present day issues with amphibian habitats, including the degradation of vernal pools, springs, and streams in Ohio. It ends on a positive note outlining what people can do to help. A resident of Adams County Ohio, John is a freelance naturalist and nature photographer who specializes in prairie ecology, herpetology, Lepidoptera, botany, vernal pool restoration, and is adept in many other facets of the great outdoors. An avid conservationist, he is a former board member of the Highlands Nature Sanctuary. John works tirelessly to share his vast knowledge of Southern Ohio with others. The annual migration of amphibians is a phenomenal event to witness. In Cleveland Metroparks, the place to be is Brecksville Reservation. A section of road is closed to vehicle traffic to protect these vulnerable amphibians but there is another obstacle, park visitors. Even visitors with good intentions add extra pressure to the amphibians' journey. This session will discuss difficulties that we have encountered along with effective ways to help protect the migration of frogs and salamanders. Kelly McGinnis has been a naturalist with Cleveland Metroparks since 2000. Her love of amphibians has led to many, cold rainy nights protecting them on their journey in Brecksville Reservation and educating visitors on the fascinating life cycle of these amazing animals. Join in for a photographic journey into the natural history, behavior and importance of vernal pool inhabitants. While tiny during some stages of their development, this visual adventure will highlight aspects of vernal pool life we don't always get to observe. Judy Semroc, Conservation Specialist, Cleveland Museum of Natural History. Judy currently works in the Natural Areas Division for The Cleveland Museum of Natural History as a Conservation Specialist. She is the founder of Chrysalis in Time‚ the first Ohio chapter of the North American Butterfly Association (NABA). Judy has co-authored two natural history guides, "Dragonflies & Damselflies of Northeast Ohio” in 2008, and "Goldenrods of Northeast Ohio: A Field Guide to Identification & Natural History" in 2017. As a former Petroleum Geologist and science teacher, Judy loves to learn about and share her passion for the natural world through hikes, interpretive programs and photography. This journey through the world of vernal pool plants is one of five presentations in the Vernal Pool Education Package. These plants have special abilities to thrive where others fail. Flooded conditions for part of the year followed by a dry spell can be hazardous for some plants but is favorable to the examples provided here. Many of the wet tolerant woodland plants are found nowhere else. This talk will cover the key considerations and steps for the construction of vernal pools, starting with good site selection. Topics discussed will include soils testing and management, construction sequencing, berm construction tips, tree preservation, simple hydrology modeling, water depths and water level control, planting, "accessorizing," and adaptive management following construction. A couple of project examples will be shared. Mark A. Dilley, Chief ScientistMark is Chief Scientist at MAD Scientist Associates. He is a Professional Wetland Scientist (Society of Wetland Scientists) and Certified Senior Ecologist (Ecological Society of America) with over 25 years of experience in wetland science, field biology, ecology, and environmental studies. Mark is certified through Ohio EPA's QDC program for Level 3 fish studies and habitat assessments for biological monitoring of wadeable streams and rivers. He has worked on projects in 25 states, but focuses his efforts on his home state of Ohio. (Make the sustainable choice: Hire locally-grown consultants!). Mark received his B.S. in Natural Resources in Fisheries Management and his M.S. in Environmental Science from The Ohio State University, with an emphasis on wetlands. His thesis research (Atrazine Fate and Transport in a Created Flow-through Emergent Marsh: An Examination of Key Processes) was completed at the internationally-acclaimed Olentangy River Wetland Research Park at OSU. Mark has continued his connection with OSU as a lecturer for the Wetland Ecology and Restoration course since 2012. This macroinvertebrate program is one of five presentations in the Vernal Pool Education Package. This broad topic is addressed with a sampling from a diverse set of small aquatic creatures that act in a variety of ways to realize a complex food web. During her teaching career with Mansfield City Schools Outdoor Education Explorations Program, Janet designed classroom lessons and all day field trips for 4th grade students to experience and explore the Ashland University Blackfork Wetlands Preserve and Fowler Woods. She is pleased to facilitate the macroinvertebrate segment of the Vernal Pool Education Package, having introduced hundreds of school children to the wonders of wetlands. This complete package of teaching resources will well-equip others to share these hidden wonders. Janet is currently working with a nature-based preschool program with the Gorman Nature Center, co-coordinating an Ohio Certified Volunteer Naturalist project for 4th and 5th graders in Nature Journaling, and still enjoys introducing children to the wonders of nature.